According to the United States Census Bureau, the city has a total area of 16.6 square miles (43 km2), of which 10.2 square miles (26 km2) is land and 6.4 square miles (17 km2), or 38.80%, is water. Its elevation is about 6,237 feet (1,901 m) above sea level. The population was spread out with 4,400 people (20.6%) under the age of 18, 2,478 people (11.6%) aged 18 to 24, 6,416 people (30.0%) aged 25 to 44, 6,013 people (28.1%) aged 45 to 64, and 2,096 people (9.8%) who were 65 years of age or older. The median age was 35.6 years. For every 100 females there were 113.6 males. For every 100 females age 18 and over, there were 115.7 males. There were 15,087 housing units at an average density of 908.7 per square mile (350.8/km²), of which 3,473 (38.9%) were owner-occupied, and 5,445 (61.1%) were occupied by renters. The homeowner vacancy rate was 4.5%; the rental vacancy rate was 14.6%. 7,684 people (35.9% of the population) lived in owner-occupied housing units and 13,350 people (62.4%) lived in rental housing units. As of the census of 2010, there were 21,403 people, 9,410 households, and 5,391 families residing in the city. The population density was 2,347.5 people per square mile (906.1/km²). There were 14,005 housing units at an average density of 1,392.5 per square mile (537.5/km²). The racial makeup of the city was 75.73% White, 0.75% Black or African American, 0.97% Native American, 6.01% Asian, 0.17% Pacific Islander, 12.48% from other races, and 3.90% from two or more races. 26.66% of the population were Hispanic or Latino of any race. There were 9,410 households out of which 30.9% had children under the age of 18 living with them, 39.3% were married couples living together, 12.0% had a female householder with no husband present, and 42.7% were non-families. 29.1% of all households were made up of individuals and 7.1% had someone living alone who was 65 years of age or older. The average household size was 2.50 and the average family size was 3.15. In the city, the population was spread out with 25.2% under the age of 18, 11.4% from 18 to 24, 33.0% from 25 to 44, 21.9% from 45 to 64, and 8.6% who were 65 years of age or older. The median age was 33 years. For every 100 females there were 107.0 males. For every 100 females age 18 and over, there were 107.4 males. The median income for a household in the city was $34,707, and the median income for a family was $40,572. Males had a median income of $26,352 versus $22,280 for females. The per capita income for the city was $18,452. About 9.1% of families and 12.5% of the population were below the poverty line, including 13.7% of those under age 18 and 7.0% of those age 65 or over. The city incorporated in 1965 by combining the previously unincorporated communities of Al Tahoe, Bijou, Bijou Park, Stateline, Tahoe Valley, and Tallac Village. A post office was established in 1967. In 1991, Jaycee Lee Dugard (age 11) was abducted from a bus stop in South Lake Tahoe; she was found alive in Antioch, California, in 2009. Gambling arrived at the Lake in 1944, when Harvey's Wagon Wheel Saloon and Gambling Hall opened as one of the area's first gaming establishments (technically on the Nevada side of the state border in the South Lake Tahoe (Nevada gaming area). But competition soon sprang up and so did the need for more permanent accommodations. By the 1950s, roads began to be plowed year-round, enabling access to permanent residences. When the 1960 Winter Olympics came to Squaw Valley, Lake Tahoe was put firmly on the map as the skiing center of the western United States. South Lake Tahoe is served by a major east-west highway, U.S. 50, which links the area with Sacramento and Carson City. The Lake Tahoe Airport serves general aviation while the closest scheduled passenger airline service is available via the Reno-Tahoe International Airport (RNO). South Lake Tahoe has a snowy highland climate with winters that are chilly, especially at night, and summers that feature warm to hot days and cool to cold nights with low humidity. The climate is either classified as a warm-summer Mediterranean climate (Köppen Csb), using the 27 °F (−2.8 °C) isotherm of the original Köppen scheme, or a continental Mediterranean climate (Köppen Dsb), using the 32 °F (0 °C) isotherm preferred by some climatologists. Summertime is also the dry season, with July averaging only 0.31 inches (7.9 mm) of precipitation, in contrast to December’s 3.81 inches or 96.8 millimetres. Snowfall is extremely heavy, with an average of 143.4 inches or 3.64 metres, whilst the wettest “rain year” has been from July 2005 to June 2006 with 31.12 inches (790.4 mm) and the driest from July 2002 to June 2003 with 9.26 inches (235.2 mm). December 2005 has been the wettest month with 13.83 inches (351.3 mm) of total water equivalent precipitation. Tahoe averages two days per year that reach 90 °F or 32.2 °C or higher, most commonly occurring in July and August. Every month of the year averages at least two nights with a low temperature of 32 °F or 0 °C or lower, and overall there are 227 mornings in an average year that fall below freezing, although only seven fall to 0 °F or −17.8 °C. Top temperatures below 32 °F (0 °C) occur on average on sixteen days per year. The all-time record high is 99 °F (37.2 °C), set on 22 July 1988, and the all-time record low is −29 °F (−33.9 °C), set on 9 December 1972, and subsequently tied on 7 February 1989. 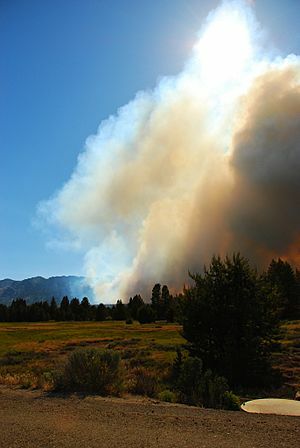 On 24 June 2007, a wildfire broke out at the Seneca Pond recreation area, near Meyers, three miles south of South Lake Tahoe. 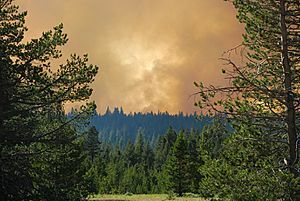 The Angora Fire, so named for its proximity to Angora Ridge, stands as the worst forest fire in recorded Lake Tahoe history. The fire spread throughout Angora region rapidly, destroying dozens of homes and large tracts of forest. Highway closures followed by evacuations put the residents in the direct line of the fire. Hotels in the area responded by opening their doors to the hundreds of evacuees that needed shelter. On 25 June, a state of emergency was announced by Lt. Gov. John Garamendi acting on behalf of the absent Governor Arnold Schwarzenegger, who was traveling in Europe. No lives were lost. Over three thousand acres (12.5 square kilometers) were burned with more than 275 structures, including 254 homes and 26 buildings damaged. On 27 June, Governor Arnold Schwarzenegger, toured the area after he returned to California. Full containment of the fire was announced on July 2. South Lake Tahoe, California Facts for Kids. Kiddle Encyclopedia.